Apple is bringing out the big bucks for its new 'Netflix for games. 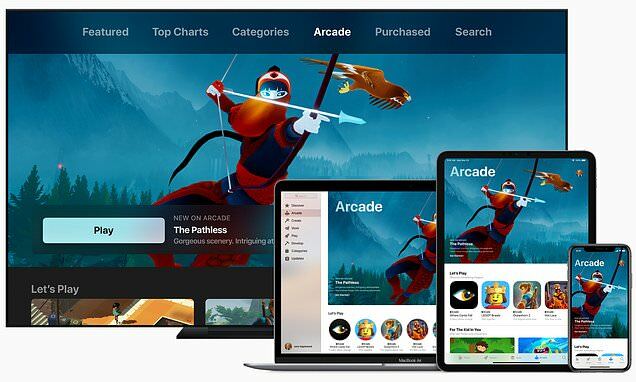 'The iPhone maker took the wraps off of its game subscription service, dubbed Apple Arcade, late last month at its 'Show Time' event, where it also unveiled news and video subscription offerings. Now, Apple is prepared to plunk down over $500 million on Arcade, in order to attract the best game titles for the forthcoming service, according to the Financial Times. Scroll down for video Apple debuted its game subscription service, dubbed Apple Arcade, late last month at its 'Show Time' event. The firm is said to be spending over $500 million on the service Apple is spending millions of dollars on each of the titles being developed for Arcade, the FT said, citing sources familiar with the situation. The firm is shelling out extra cash to developers who agree to list their games exclusively on Arcade, with the agreement that the titles can be offered on Android devices, Microsoft's Xbox or Nintendo Switch after a few months, according to the FT. Arcade is set to arrive this fall and will let users play exclusive games ad-free on mobile, desktop, and Apple TV – meaning you can stop playing on one device, and pick up where you left off on another. RELATED ARTICLES Previous 1 Next Internet age really DOES we get bored more easily and have... Elon Musk claims Tesla will achieve full autonomy by NEXT... Internet Explorer hit by exploit that lets hackers steal... 'Proof' of life on Mars: Meteorite from the red planet... Share this article Share If Apple has set aside roughly $500 million for Arcade, that's half the $1 billion budget it previously established for original content production. However, as many have pointed out, Apple will have to spend a pretty sizable amount to attract top titles that consumers will be willing to pay for.It's unclear how much Apple Arcade will cost, but HSBC estimates that the service could generate $4.5 billion in annual revenue for the firm by 2024, the FT noted. Apple Arcade is a game subscription service that lets users access more than 100 'exclusive' titles from almost anywhere, including mobile and desktop devices and your television Apple Arcade, the firm's new game subscription service, will let users play games across mobile, desktop and Apple TV. It'll feature games from LEGO (pictured), SEGA and othersHSBC analysts anticipate that the firm could count 29 million Arcade users in 2024, who would be paying subscription cost of $12.99 per month. First launched last month, Arcade gives users access to 100 titles from developers like Cartoon Network, LEGO, Sega, Konami and Annapurna Interactive, among others.